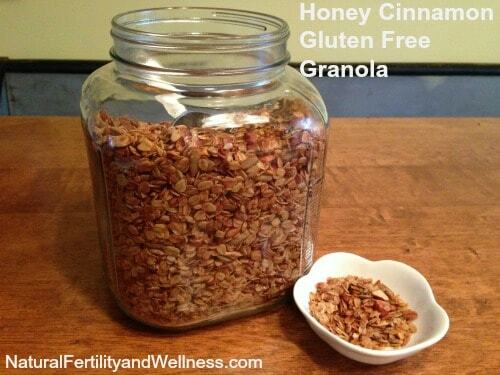 Honey Cinnamon Gluten Free Granola - cheaper than storebought! When I was in high school I started my day with a large fresh deli bagel and a soup bowl of cinnamon raisin granola with vanilla yogurt.. in other words, a sugar bomb. And I could never figure out why I was sluggish yet shaky and starving an hour later, unable to eat anything until 11:40 lunch hour! Around that time I began to nanny for a family who (gasp!) MADE THEIR OWN FOOD. They made granola, baked bread, harvested basil when they wanted pesto, made birthday cakes from scratch and it not only intrigued me but completely lit me up. The door to a whole new world opened up for me. First my family thought it was fun, then they thought it was weird (because I made them taste everything I made and it wasn’t always great), and for years now they have been inspired and quite willing to be the lucky recipient of whatever might come out of this little kitchen of mine….except for that notoriously bad stir-fry night. My family and boyfriend (now husband) also thought it strange that I could eat any food at any time-versus only “breakfast” food in the morning, “dinner” things in the evening, and a sandwich for lunch. I had started heating my dinner for breakfast and making omelets for dinner. When I introduced my granola that was great to eat anytime, anywhere…they no longer thought this “healthy eating” thing was so strange. This recipe is simple, easily adaptable and quite forgiving. I’ve started to track every single time I make it because my husband will say, “That one! Make that one again!” and I’ve found it’s easier to look back at my notes than it is to recall when I was in the kitchen a week ago and three recipe creations later. Almonds are a great source of riboflavin and L-carnitine, which are two brain nutrients vital to increased brain activity. They are a healthy mono-unsaturated fat making them super heart healthy and contain vitamin E which is great for supporting fertility. (you can even make them more nutritious by soaking them first. Cinnamon is long known to be a great blood sugar stabilizer and when your blood sugar levels are under control your body can better produce the reproductive hormones you need. Pumpkin seeds (also known as pepita seeds when hulled) are a great source of zinc, which is an important nutrient for sperm development. Honey, locally sourced and taken at a few teaspoons per day is a fantastic way to boost your body’s ability to alleviate allergy symptoms. Coconut oil has a high level of Lauric acid and the medium chain fatty acid content helps to boost metabolism (among a myriad of other benefits). These ingredients are often found in many pantries, making this recipe easy to put together. This recipe is naturally gluten-free, but if you have celiac make sure to purchase oats that are certified gluten-free. Easy to make and store for later. Oil the baking dish (for granola's I use my big Pampered Chef stoneware roasting pan) with coconut oil to avoid granola sticking to the bottom. In a small saucepan on low, heat the coconut oil and raw honey just until the oil is melted. Place the rest of the ingredients into a 9x13 pan and using clean hands, toss them together. 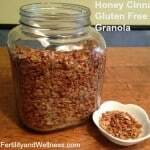 When the honey and coconut oil are melted and blended together well, drizzle onto granola ingredients and stir to combine. Set in the oven, stirring every 15 minutes until done to your preference (about 45 minutes to one hour). Granola should begin to turn light brown and will have a light crunch to it. You can also add up to one cup of dried fruit if you wish.